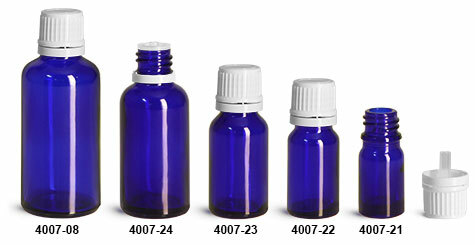 Choose blue glass euro dropper bottles with white tamper evident caps for products such as aromatherapy and pharmaceuticals. These blue glass bottles provide a nonporous impermeable packaging option, while featuring a vibrant color that catches the eye. The white caps have many useful design features, they are ribbed for comfortable gripping, include orifice reducers for controlled dispensing, and offer tamper evidence for added security.